The Dalai Lama’s message of tolerance, personal responsibility, and charity has provided a unifying commonality for a group of folks in Spokane who have formed an organization called Friends of Compassion. The central question arose: “How can institutions, not just persons, act compassionately?” The group is committed to implementing the Dalai Lama’s message by working with people in faith, education, government, social services, and business to see how compassion can be incorporated into the very framework of their institutional structures. Many organizations are now pursuing community advancement, and all express ideals of compassion in their own language. Friends of Compassion seeks to harness this positive energy for common good, in the pursuit of civic goals and local needs. A wonderful example of this commitment happened recently at a monthly meeting of Friends of Compassion. The topic was Compassion for the Rule Breakers: The System called “corrections,” featuring four presentations from people who work with incarcerated men. They believe in people’s ability to grow and change. They always hold a long-term view for each person they work with, knowing that many of them will be imprisoned again and that it takes time to help them make better choices. For both of them it is crucial to manage and work with their own judgments, filters, and stereotypes. To develop trust with the inmates, it is essential to keep your word—to do what you say you will do and not do what you said you would not do. Ven. Chodron then shared her experiences from corresponding and visiting incarcerated men for 15 years. She agreed with many folks who work or volunteer at prisons that the correctional system is spiritually bankrupt. It is moving for her to hear the inmates express hope and enthusiasm about cultivating compassion and love in their minds even within such a harsh environment. Venerable said that after reading about their childhoods it is clear to her why these men grew up to become imprisoned. Ven. Chodron ended by sharing that many of the men are gifted in art, poetry, and writing, and she hopes to publish a book on their works. She believes it is very important for the society that wants to punish these people to be able to see the humanity in them. Professor Russell Kolts from Eastern Washington University spoke about the compassion-based therapy that he facilitates with the incarcerated men at Airway Heights Correctional Center. The therapy model incorporates a workbook for the men to keep track of situations where negative emotions arise, particularly anger. The book helps them to identify trigger situations and helps them to make other choices besides responding with anger. The men then gather in groups to share with each other with Russell guiding them through the process. What began as a very small group now has a waiting list of 60 for the next series of compassion therapy. Finally, Craig, a former felon incarcerated for a white-collar crime and imprisoned for 3 years, shared his experience of the prison system. He described the whole process from start to his release as being humiliating and painful. Craig worked on being kind to everyone he met and depended on his faith for strength through his time in prison. He vowed to himself that he would never let himself wander into a situation or life experience like this again. It was inspiring to listen to testimonials of how compassion can bring connection between incarcerated men and the people who support and help them manage and grow in such a difficult life situation. 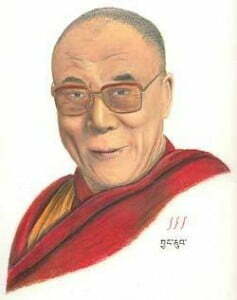 For more on Dharma in prisons check out the Prison Dharma section at Portrait of His Holiness the 14th Dalai Lama by John F. Johnson©, an inmate in Grafton OH. To use picture, seek permission through the webmaster at thubtenchodron.org.